Certain individuals, whether children or adults, have a tendency to breathe through the mouth instead of the nose. Whether you are exercising, sleeping or going about daily life, it is preferable to do nasal breathing rather than mouth breathing. When you breathe through your mouth, your brain is tricked into thinking that carbon dioxide is escaping the body too quickly. This stimulates the production of mucous, as the body attempts to slow the breathing. Nasal breathing is healthier than mouth breathing for several reasons. Your lungs take oxygen from the air, and absorption of oxygen happens mostly on exhalation. Exhaling through the nose, which is smaller than the mouth, creates greater air pressure and therefore a slower exhalation. This gives the lungs extra time to extract a greater amount of oxygen. Mouth breathing is common in individuals whose nasal passages are blocked or restricted. For example, a deviated septum or small nostril size can lead a person to breathe primarily through the mouth instead of the nose. Breathing through the mouth is inefficient, however, and leads to hyperventilation. This, in turn, causes or worsens symptoms of asthma, heart disease and high blood pressure. Nasal breathing is more efficient than mouth breathing in terms of supplying oxygen to the body. When performing cardiovascular exercise, it is therefore preferable to inhale and exhale through the nose. If you are exercising and become out of breath, it is faster to exhale through the mouth than the nose, but this will reduce the amount of oxygen extracted from each exhalation. Additionally, the nostrils and sinuses play a part in filtering and warming the air that is inhaled into the lungs. This filtering effect is helpful in keeping bacteria and particles out of your body. When exercising in chilly weather, breathing through the nose prevents cold air from going straight to your lungs and causing chest and throat pain. Breathing through the mouth rather than the nose during sleep is associated with loud snoring. This happens because of the way that breathing is regulated by nerves in the nasal passages. 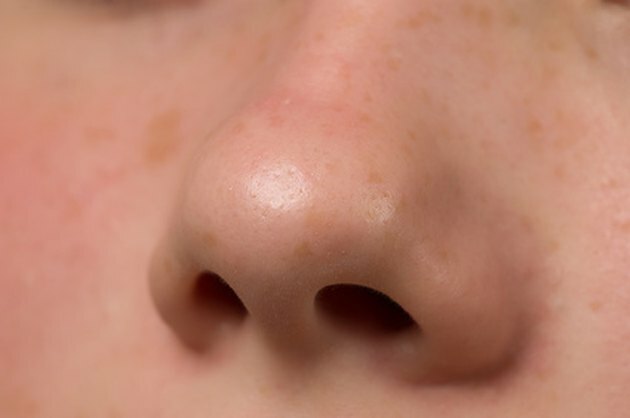 An area of the nose known as the nasal mucosa is a sensor for inhaled air, and when nasal breathing occurs, the nasal mucosa sends stimuli to the breath-controlling reflex nerves. When mouth breathing occurs, the nasal mucosa does not send these stimuli to the reflex nerves, and this can result in an irregular breathing pattern. This can lead to heart conditions or the development of sleep apnea, in which a lack of breathing regulation causes short periods of suffocation. Concentrating on nasal breathing throughout the day will help you increase nose breathing and reduce mouth breathing. Meditation and breathing exercises can also help; because the nose is smaller than the mouth, nasal breathing is inherently slower than mouth breathing and will help reduce stress and hypertension. If mouth breathing while sleeping is a problem, try using nasal strips, which fit like a bandage over the bridge of the nose and open the nasal airways to promote breathing through the nose rather than the mouth. Other snoring remedies are available which work to reduce nasal breathing.